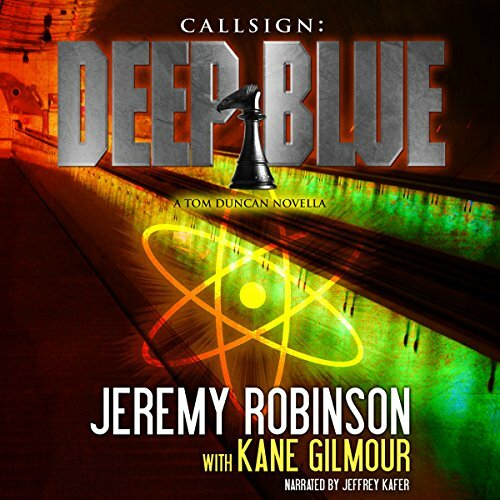 Tom Duncan - callsign: Deep Blue - former Army ranger, former president of the United States and handler of the black ops force known as Chess Team, is visiting the team's new secret headquarters. The underground facility, known as Alpha, once belonged to Manifold Genetics, a corrupt corporation shut down by Chess Team. But despite being abandoned for years, Alpha still hides secrets. Security doors slam shut and lock, sealing Duncan and his assistants inside. As Matt Carrack, the leader of Duncan's security team, attempts to gain access, Duncan discovers they are not alone inside the abandoned facility. High-tech intruders have infiltrated the base, their goal unknown. But a far greater threat rises from the subterranean depths beneath Alpha - failed regenerative experiments from the days of Manifold, and they're fast, hostile and hungry. I am a fan of Robinson, see my reviews of Island 731 and Project 731. I am presently listening to Second World and expect to write a glowing review early next week. This book, not so much. It is advertise as book 1 of Deep Blue, but it is also book 3.6 of Chess Team. I am not sure what the difference is, but I felt lost throughout most of the story. I was not even sure who was the good guys and who were the bad guys. In a book of a little over 3 hours, the first 45 minutes is spent catching you up, which means lots of telling and no showing. It sounded like I missed a good book, as the previous had lots of mythological creatures but this book had GIANT SALAMANDERS. Given, these salamanders are about seven feet long, similar to alligators, but still, salamanders? What next, giant bunny rabbits? Several phrases were used evidently to impress us. I know nothing about dirt bikes, but evidently HDT dirt bikes are better than others. Many times a dirt bike is used, but it is never just a dirt bike, it is always a HDT dirt bike. That is just one example. P.S. Read the other reviews. Did Mani copy off of Allenby or is somebody giving out talking points? 23 sur 33 personne(s) ont trouvé cet avis utile. Yeah, giant mutant man-eating salamanders. In a hidden research facility in the northern US mainland. Filled with giant mutant man-eating salamanders.........Seriously??????????? I was really glad to read this one, to see how Deep Blue is going after the awful humiliating way he had to give up the presidency. Nice that he had the chance to be an action hero. Would you consider the audio edition of Callsign to be better than the print version? I didn't read the original in print. What other book might you compare Callsign to and why? It's like all the Sec-Op books but not in this case because they are fighting men and monsters. The man and woman were base jumping in the dark tunnel when one of the "things" dropped onto the man's chute and he in turn dropped on the lady and they hit the floor with the "Thing" under them and she got up and forgot to tell him what was under him. I could just see his face when he found what he was lying on! Not really, I wanted to savor it over a couple of nights. Sort of like a bedtime story. But that is how I listen to all books from Audible. Now I have to go back and read the first book! So we finally get to see 'Deep Blue' in action, and it was great to see. The man behind Chess Team is as good as the rest of the team at getting himself into and out of trouble. A great, fun story. Kane Gilmour & Jeremy Robinson are a great team and I look forward to reading more from them. Jeffrey Kafer does a great job with the narration, immersing the listener in the story. So we finally get to see 'Deep Blue' in action,The man behind Chess Team is as good as the rest of the team at getting himself into and out of trouble. A great, fun story, a great team and look forward to reading more from them.